Average Health. 83 yrs old. I use the product instead of the leg bag. I currently have suprapubic catheter. I study mechanical engineering and right now I have speech class in which I have to dress very nice for speech. It was hard to hide the tube and leg bag in those nice pants. But now I do not have to worry about it. Nothing pulls on the tube. These are sturdy, I have use one for years for feeding tube going to buy six more and tape one,in package to wheelchair,,,in case I dropped it and cant reach it ..Am pleased to find Allegro,, as they have any "little thing " I may need........YAY!!!!!! I just started to use this plug (4 days ago.) It is working very well for me and I open and shut plug frequently (urge to pee) Now I am concerned that the convenient little handle might break off. I am using a Foley catheter for four weeks and then it's replaced at home by a visiting nurse......anyone? will it last four weeks of use? 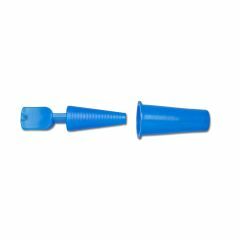 I use these to plug my feeding tube. They are in and out of the tube at least 15X a day. My biggest concern is losing the darn, little things. The is a hole in the tip, so it can be attached to something. They are very sturdy. I doubt you will break them. Why don't you get a few to have on stand by. They are very cheap. May be Home Health will give you a spare or two. Thanks very much...those little plugs are incredibly strong...I did buy 10 more plugs, just in case! It will last much longer than 4 weeks. To help prevent UTIs, I clean it and end of cath with alcohol wipe every time before plugging the cath. And replace with every cath change.